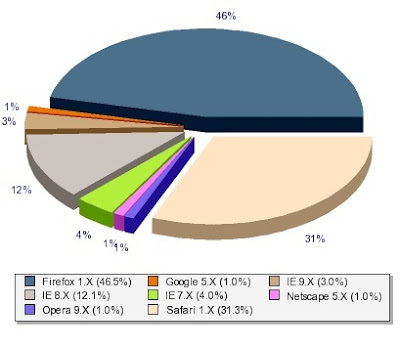 Current (as of this afternoon) breakdown of browsers used by visitors to NuclearToast. Well, the IE7 is probably mostly me. My work computer is only allowed to use IE7 (and they haven't identified your site yet as "non-work related" hehehe). The rest of the time I use Chrome... have I mentioned how much I hate IE7?